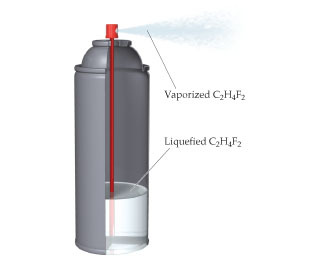 Solution: As shown here, one type of computer keyboard cleaner contains liquefied 1,1-difluoroethane (C2H4F2), which is a gas at atmospheric pressure. When the nozzle is squeezed, the 1,1-difluoroethane vaporizes out of the nozzle at high pressure, blowing dust out of objects. Defining the 1,1-difluoroethane as the system, do you expect qsys for the process to be positive or negative? As shown here, one type of computer keyboard cleaner contains liquefied 1,1-difluoroethane (C2H4F2), which is a gas at atmospheric pressure. When the nozzle is squeezed, the 1,1-difluoroethane vaporizes out of the nozzle at high pressure, blowing dust out of objects. Defining the 1,1-difluoroethane as the system, do you expect qsys for the process to be positive or negative?